It's possible to grow raspberry plants under a variety of conditions, although they thrive best under full sun on non-alkaline, fertile loam soil. During the colder months of the year where they have no natural protection, it is advisable to provide some form of artificial protection. Even though a well-drained soil is a must for good results, a sandy soil requires a lot of organic matter incorporated in preparation. Raspberries require a plentiful supply of moisture during the entire growing season. 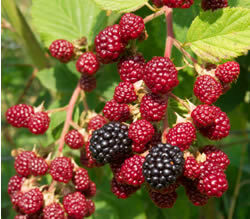 The berries are extremely versatile and can be eaten as fresh fruit, and used in preserves, pies and pastries. They take up very little little space producing crops the 2nd season after planting. Birds in particular love the fruit, so bird netting should be used unless you want to share your harvest. Autumn Britten is a sister seedling of Autumn Bliss that has significantly better fruit firmness and a better producer. It ripens 3 weeks ahead of Heritage. The wonderful berries are long and conical shaped, with bright red color and good flavor. Plants are relatively vigorous, and it is recommend to plant them at 22"-24" in-row spacing. 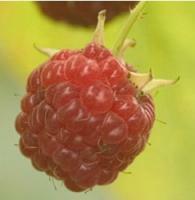 The Heritage Raspberry has medium-sized red berries with excellent flavor and quality. It is superb for eating fresh or for making pies and jams. Heritage is an exceptional everbearing variety that yields a crop in mid July and again at the beginning of September. They are pretty disease-resistant, hugely productive, easy to grow and will bear fruit the 1st year. Royalty Raspberries are a cross between a purple and a red raspberry. It has a large fruit size and plant vigor of a purple hybrid with the high quality of a red. This raspberry is fantastic for jam or jelly, and if it is harvested at the red stage it has the sweet light flavor of red raspberries. The Royalty ripens mid-July. 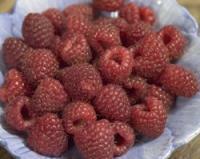 It is hardy, has good yield potential, great insect resistance and is one of the largest raspberries.